Several laughs on this funny farm! Oink and Gobble and the ‘No One Can Ever Know Secret’ is a humorous children’s adventure book. Will the farmer or the girl find out their secret? 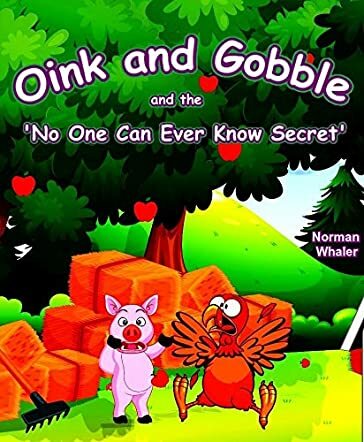 Oink the pig and Gobble the turkey have promised never to reveal their ‘no one can ever know secret.’ Author Norman Whaler has created a series of imaginative stories, which take place on a farm. All the animals on the farm know the secret, but can they keep the humans from finding out? This book also includes a bonus page of clean, humorous jokes that children will like. Home and school libraries will find this entertaining and engaging animal book a welcome addition to their shelves. Artist Mohammad Shayan created the colorful illustrations in Oink and Gobble and the ‘No One Can Ever Know Secret’. The bright, colorful artwork is humorous and accurately depicts the farm animals and the humans in animation form. I love the panicked look on the turkey’s and the pig’s faces when they think the humans have found out their secret! Even the other animals are scared when they see the girl talking to the farmer. Did the girl witness it and is she revealing the secret to the farmer? Run! Run was the first thing Oink thought. But the girl is not telling the farmer the secret. What are they talking about? Plot twist. Writer Norman Whaler has created a lovely silly story that children will enjoy reading. And parents will have fun reading this to their children. Oink and Gobble and the 'No One Can Ever Know Secret' is a cute children’s picture book about farm animals and specifically about Oink the pig and Gobble the turkey. The story begins simply with an introduction to Little Bottom farm which contains plenty of animals including the pig, chickens, the turkey, the dog, etc. Oink the pig is a curious, mischievous, adventurous pig while Gobble the turkey is more calm, patient, and stable. In spite of this, the two are best friends and spend a lot of time together. One day, Oink gets afraid and anxious that the humans have found out their secret because he has observed a young girl following him around everywhere. As a result, the farm turns a bit chaotic and Oink and Gobble start running around. I enjoyed Oink and Gobble and the 'No One Can Ever Know Secret' by Norman Whaler and I am sure children will also enjoy reading this charming tale. The illustrations in the book are very colorful and fun and complement the story well. There is humor in this story, especially with regards to Oink the pig’s character, and the end result is one which is supposed to teach the value of friendship and love, and also not to be afraid of things we don’t know and to find out the facts first. This book can be read aloud to very young children as well and Norman Whaler’s simple writing style makes it easy for a child of any age to follow. This is a good children’s book! Oink and Gobble and the 'No One Can Ever Know Secret' is a children’s animal picture book written by Norman Whaler and illustrated by Mohammad Shayan. Oink and Gobble lived on a farm in Little Bottom along with the farmer’s other farm animals. Oink was an excitable and imaginative little pig who seriously thought that UFOs and Bigfoot might be real. He loved to listen to the boy and girl who lived on the farm with their parents when they talked about great mysteries like those things. Gobble was more pragmatic and calm, and her presence sometimes served to temper Oink’s exuberance. The turkey and pig were very different, but they never ever fought and loved being with each other. They and the other animals on the farm had one big secret that they guarded very carefully. They all knew that the farmer, his wife, and the boy and girl could never ever know that secret -- at least not until they were ready. But, as Oink hesitantly confided to Gobble one day, one of them might know it already. Gobble was stunned to hear it, but knowing her excitable friend as well as she did, she wasn’t quite sure things were as bad as he feared. What could be the secret that “no one can ever know?” Norman Whaler’s children’s animal picture book is a heartwarming and fun book that introduces two very different farm animals, who are the very best of friends, as they consider whether the animals’ big secret has been revealed. I enjoyed seeing how these friends share such a tight bond despite their differences and found that to be a marvelous message for young readers to hear. Mohammad Shayan’s illustrations are bright and cheerful; each one is packed with details that make it impossible to turn a page without examining it carefully. Whaler’s story is told in language that is perfectly suited for a child who’s just learning to read on their own. It’s also a grand selection for story time. Oink and Gobble and the 'No One Can Ever Know Secret' is most highly recommended.